This vegan paella goes above and beyond with homemade vegan chorizo. To make the chorizo sausage, mix all the dry ingredients together in a bowl. Add the wet ingredients and knead together for 5 minutes, as if making bread, until you have a firm dough. Divide the mixture into 2 equal portions. Form each half into a rough log shape. Lay out a sheet of cling film and place one log in the centre. Roll the cling film around the log, push out any trapped air and twist the ends of the cling film together around the log to tighteninto a large sausage shape. Wrap the sausage in kitchen foil. Repeat with the other portion. Place the wrapped sausages in a large saucepan of water and bring it up to a low simmer. Poach the sausages gently for 1 hour, until they feel very firm when squeezed. (Top-up the water if necessary.) Remove the logs from the water and leave to cool. Put in the fridge to chill overnight. Don’t remove the wrapping until they are completely chilled, or they will expand and lose their shape. Preheat the oven to 180C/160C Fan/Gas 4. Pour the stock and wine into a large saucepan and stir in the saffron. Bring to a slow boil. Add the rice, reduce the heat and simmer for 15 minutes. Keep an eye on the rice and don’t stir it too much. If it starts to boil dry, add more stock. Meanwhile, heat a little oil in a large paella pan. Add the onion and peppers with a sprinkling of salt and cook over medium heat for 5 minutes, until beginning to soften. Add the garlic and spices and cook for another 10 minutes. 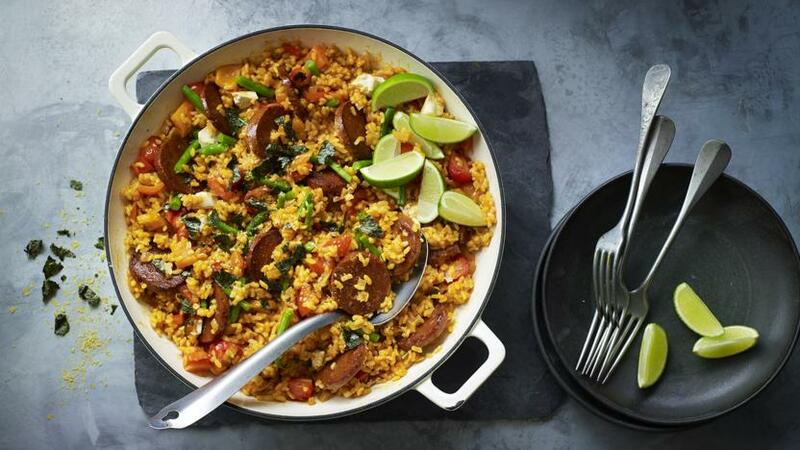 Once the rice has absorbed most – but not all – of the liquid in the saucepan, transfer it to the paella pan. Stir to combine all of the ingredients, then mix in the tomatoes and green beans. If the mixture seems too dry, add some more stock at this stage. Bake in the oven for 30 minutes. Heat the remaining oil in a frying pan. Add the seitan sausage and tofu and cook over a medium-high heat for 3–4 minutes until brown and crispy. Remove the paella from the oven and add the tofu and seitan sausage to the dish and stir. Serve immediately in the paella pan, garnished with slices of lime, nutritional yeast and a sprinkling of crispy seaweed.